I have a book on German military bands and music in the Nazi era (by Brian Matthews.) while it does not list every song, there is nothing I found with similar lyrics (The Future Belongs To Me, or anything like it.) I'm sure the composers knew what typical Hitler Youth songs were like and all of the other political party songs, so they were able to parody the style quite well. It is interesting that many "skinhead" bands have done later versions of the song, thinking that it was a real party song! Further searches - "Es zittern die morschen Knochen"
has one short phrase that could possibly translate as "Tomorrow belongs to Us" but I don't think this was the referenced song in the book. It is nothing like the song in Cabaret. Es zittern die morschen Knochen "The rotten bones are trembling" by Hans Baumann was, after the Horst-Wessel-Lied, one of the most famous Nazi songs. It was the official song of the Hitler Youth: hence the occasional attacks on the elderly in the song. Many Germans know the incorrect quote "Heute gehört uns Deutschland und morgen die ganze Welt", but few know the whole song. The original song's refrain was "Denn heute, erhört uns Deutschland und morgen die ganze Welt" (for today, Germany hears us and tomorrow, the whole world). This was later misinterpreted as "Denn heute gehört uns Deutschland..", meaning "For today, Germany is ours..". As a semi-retired police investigator and firearms instructor, both military and State,, I often home-in on inaccurate firearms descriptions. Like when Bernie talks about preferring the Walther PPK over the much larger Walther designed P-38 military issue pistol, because he did not like the P-38's exposed hammer. Actually the Walther PPK and slightly larger Walther PP also have exposed hammers. Although while they are rounded, the are still exposed and serrated. And do not get me started on characters who talk about slipping off the " Safety" of a Smith and Wesson or Colt revolver. They do not have safeties. I am still waiting for the next two books to arrive in the mail. They are addicting. In "A Man Without Breath", March and April 1943, Bernie is single and falls in love with Ines. But in a German Requiem, 1947-1948, he says he has been married to Kirsten for 7 years. But who cares! I love the books and I can't wait to find the ones I haven't read yet. In "Field Grey" Elisabeth lives at Motzstraße, a long street connecting Schöneberg and Wilmersdorf. While waiting for her in chapter 29 Bernie walks around a little bit, ending in the Rosenkranz Basilika in Steglitz. That'a 5-km-walk! And maybe it's the german translation, but in chapter 37 there's a mixup about the (very famous) restaurant and hotel "Am Steinplatz", calling it "Am Steinbach" (wtf?) wenn Mielkes father is leaving the building. In "A Man Without Breath", Bernie observes that Colonel von Gersdorff wears the Iron Cross first class around his neck, but that medal was worn on your breast pocket. The Knight´s Cross, was worn around the neck. In German "Soldatenjargong", an officer who badly wanted to win this award, was suffering from "Halsschmertzen" - a sore throat! Thank you for this nice forum! In 1936 Bernie refers to Clayallee in Dahlen part of Berlin . I thought Clayallee was named after American general Clay, who was in charge of Berlin brigade during the airlift( 1949) or the building of the wall( 1961). Here are a few I noted: In MWB (chapter 10), PK says of the sickle-shaped needle BG persuades Ines to use at the end of the autopsy that "it looked as if it could have stitched a sail on the Kruzenstern" - a strange comment, as Kruzenstern (built 1926 as the sailing ship Padua) was not handed over to the Soviets who named her after an Estonian explorer in the service of the Czar, until 1946. Maybe PK has seen the real Kruzenstern - she's still operating as a Russia Navy sail training ship today? Another recurrent mention that's not quite right is the term "Zeppelin volunteers" for Russian Hiwis (Hilfswillige = volunteer support workers) and military personnel willing to join the German army (Pk also uses this, somewhat more appropriately, in "Hitler's Peace"). This term/topic is more complicated - in fact Operation Zeppelin specifically refers to Walter Schellenberg's project to recruit local Azeri forces in the Northern Caucasus. The correct generic term for what PK is referring to in the BG novels was "Ost-Bataillone/Legionen" (Eastern battailons/Legions) or "landeseigene Verbaende" (locally raised units) insofar as combatants are concerned. Nearly 100 Battalions with almost half a million soldiers were raised from 1942 onwards, many by the Waffen-SS, exploiting anticommunist sentiments. In the Ukraine, such forces were commonly (but not collectively as a formation) known as "Ukrainian Liberation Army" units. Hitler reluctantly approved formal recognition of General Vlasov's "Russian Liberation Army", a European equivalent of Imperial Japan's "Indian National Army", in late 1944. Around the same time, a reorganisation of the Wehrmacht divisional structure meant that 13 percent of each (slimmed down) Grenadier (Infantry) division's establishment consisted of local Hiwis in non-combat roles. Police and other uniformed non-combatant formations (notably concentration and POW camp guards) naturally also included a high proportion of personnel recruited in this way - these would generally be known as "Kapo", from French "Caporal" (Corporal): An example being John Demjanjuk. Like "all" pointed out on June 4, Kirsten seems to be completely forgotten in the later novels. I just finished reading the Berlin Noir trilogy for the second time (in German - very well translated I find, but then again, my German is not perfect) and at the end of "A German Requiem" (set in 1947) Bernie says that he's been married for 7 years. Yet in Prague Fatale (set in 1941) he says his wife has been dead for 20 years and no mention of the current wife. That's quite sloppy writing, I find. Otherwise, thoroughly enjoy the books. In "A German Requiem", Bernie mentions converting to the Catholic relegion while he was a prisoner of war in Russia and that he made a habit of attending mass when he returned to Berlin. But in "One From the Other", he despises all things Catholic. Just finished A Man Without Breath, loved it but a couple of pedantic niggles. Chapter 5 page 289. Bernie is talking with a medical orderly who tells him that medical supplies are being despatched to Prokhorovka. As far as know, the Germans would attack toward Prokhorovka during the Kursk battle but not reach it. Chapter 14 page 499. Bernie is awaiting trial in Smolensk, he is told of "a major offensive being planned north of here at a place called Kursk which according to my map of Russia is very much to the south of Smolensk. Please don't be put off by this nitpicking! In The Lady From Zagreb in Chapter 41, Bernie and Dalia go for drinks in Munich at the Kon- Tiki a bar with polynesian decor drawn from Thor Heyerdahl's exploration and subsequent best seller. Heyerdahl's trip took place in 1947 making the Kerr's WWII setting somewhat inaccurate. Is there a credible explanation that I am missing? In The Lady from Zagreb the author refers to the Clayallee a prominent street in Berlin . I was always under the impression that this street was named Clayallee in honor of American General Lucius Clay who was Deputy Governor of Germany after the war. This is where our embassy was when I lived there in the early 50s. Does anyone know what this street was called during the war. This may be the author's error. A Quiet Flame, chapter 5, p.43 in my paperback, has the wrong gender translation in Spanish. Says "resentida" which is feminine, but should be "resentido" the masculine. Not a biggie but it kills my suspension of disbelief. Just started the series 3 weeks ago and am on my 5th one, they are great, thanks Phillip. I've just started reading the books and really enjoy them, but so far I've found numerous errors related to firearms. In German Requiem, the big fellow with the damaged face fails to kill Bernie because he comes in with the hammer cocked, but the safety still on with P38. That's impossible. The safety on a P38 acts as a decocker. The hammer will not stay back if the safety is engaged unlike the Colt 1911 design. In A Man Without Breath, Bernie hears the rifle crack, then hears the bullet strike a tree near him. That's impossible as well. The rifle bullet would have been traveling faster than the speed of sound. The bullet would have struck the tree before he heard the crack. I've found several other firearms related errors, but those are just two that I remember off the top of my head. Mr. Kerr strives for details, but you can tell he's not a firearms enthusiast. Being a military firearms collector, they issues jump out at me immediately. As a real Berlin-born "Bernie Gunther", I can get over the minor discrepancies; I am just fascinated by the amount of historical and site details PK weaves into the books. I've read nearly all, just missing One from the Other and the new one. So my concerns are more personal, mainly his name. In German his name would be Bernd, his surname spelled Günther. As most know, the latter is both a given and a surname. PK seems to know this nuance since on Page 248 of A Man without Breath, he correctly spells Günther von Kluge. So for the sake of authenticity and consistency, he should have used the German spellings. If I were writing about a British detective named Frederick in German, I would not germanize it to Friedrich. Just trying to follow the nit-picking tradition of this blog!! Some of the prior comments wondered what gaps PK could fill in future books. I wonder where 2nd wife Kirsten comes into the picture. Also, how did he survive the end of the war? I lived through that at a very young age and know it was a very difficult time for my father. There's a large gap from 1943 to 1947. This should be good for at least two more books. Overall, these novels are spell-binding and addictive and I can't wait to read these two, but to close, one more nit-pick: In Prague Fatale, he mentions driving an Audi; this nameplate did not exist until the 1970's. It was called a DKW at that time--pronounced day-kah-vay--and after the war was renamed Auto-Union, then later Audi. - The scene set in 1943 at the "Kon-Tiki Bar" in the Bayerischer Hof Hotel in Munich is a real head-scratcher. The Kon-Tiki sailed the Pacific after WWII, in 1947, and it's an internationally celebrated event. The tiki bar craze followed in the 50s. There WAS a chain of hotel bars called Kon Tiki, they were usually located in Sheraton hotels to compete with the Trader Vic's bars that were usually at Hilton hotels. However the Bayersicher Hof never had one. A Google search shows it actually had a legitimate Trader Vic's, which opened in 1972 and is still in business. Aside from the wrong bar name, the mere idea of a tiki bar in 1943 Nazi Germany is absolutely absurd. Such a weird error for Kerr to make when his research is otherwise so thorough. It's so jarring and inexplicable, that I actually hope it gets caught and fixed in future editions. - Bernie rattles off a list of French Riviera luxury hotels in one of the framing scenes, set in 1956. He mentions the Carlton in Cannes, among others, then a few more, then the Hotel de Paris in Monte Carlo, where he says Hitchcock shot "To Catch a Thief". Problem is Hitchcock shot that film at the aforementioned Carlton, not the Hotel de Paris. Finland exited WWII in 1944, not 1943 as stated in Philip Kerr's "The Lady from Zagreb"
In chapter 16, this book is set between July-August 1943, mentioning that "the Battle of Kursk wasn't going well for the German forces". In chapter 28, supposedly around a month later, the hotel in Zürich has among its' guests the Baron von Mannerheim, Finland's head of state, who has "recently signed an armistice with the Soviet Union". That's a year off. A ceasefire ended hostilities between Finland and the Soviet Union on 5 September 1944. The Moscow Armistice was signed on 19 September 1944. Maybe Kerr confuses the Finnish armistice with the surrender of Italy to the Allied forces in September 1943? That would fit the timeline. Mannerheim was most certainly not in Zürich in August-September 1943. He was commander-in-chief of Finland's defence forces until the end of 1944, and from 1944 to 1946 the sixth president of independent Finland. It's true, however, that Mannerheim spent his last years in Montreux, Switzerland, from 1947 to 1951. P 107, Arianne refers to Teplitz being near Prague and Dresden. Google maps shows Teplitz to be very very small town in NE Germany and Teplice to be near Praha. I wish these books contained detailed maps from the time in which the narrative is taking place. It might mean quiet a few maps per "Gunther" but I'm a map-aholic so more's the better! In chapter 5 of 'The Pale Criminal' it really bugged me that Kerr seems to make such a hash of describing the state and Party security apparatus. "At the same time, appreciating the difference between the SD, or Sipo as the Security Service was sometimes called, and the Gestapo was a rather more elusive matter, even for some of the people who worked for these two organizations." Aside from the issue of how the 'appreciation of a difference' could be 'elusive', the SD was never analogous with or called 'Sipo', and the SiPo was never called 'the Security Service' (that would be the SD, as in 'Sicherheitsdienst'). The SD was the Party's intelligence-gathering organisation; the SiPo was the state's Security Police (as in 'Sicherheitspolizei'). SiPo comprised the Kripo and the Gestapo, as distinct from the 'regular' police of the Orpo. Both SiPo and Orpo were brought under the control of Himmler when he was given charge of the police. Heydrich - who had been in charge of the SD - was then also given the executive reins of the SiPo. In this way, whilst keeping abreast of the various conflicting and overlapping fiefdoms of various Nazi bureaucrats could be difficult, it would have been rather straightforward for an (ex) officer of the Kripo such as Gunther to understand that the state's 'security policing' capability (represented by the two arms of SiPo) had been subordinated to the Party's own snooping infrastructure and the Nazi hack running it. living in zurich, i pretty much agree with kerr's description of the city. however, on p.306 he describes zurich's police headquarters as "disproportionally large, semi-castellated building with a big central clock and two white painted wings". by this, he actually describes zurich's army barracks which in the 1940s (up until the early 1980s) were still used by the swiss army. the actual police HQ - where bernie was interrogated - is a much smaller building to the left of the "Kaserne". living in zurich, i find the local details in The Lady From Zagreb reasonably accourate. however, he did get one thing wrong… on page 306 the zurich police takes him to their HQ for interrogation. 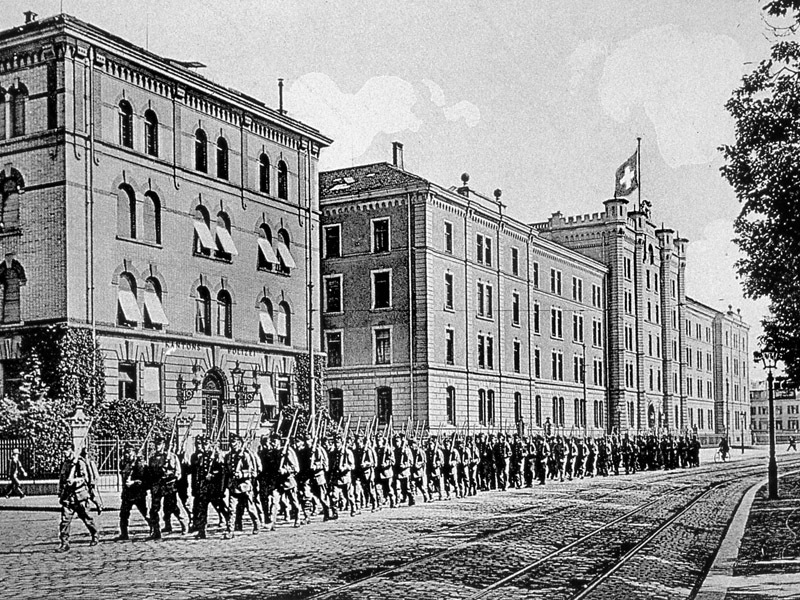 kerr describes it as "a disproportionately large, semi-castellated building with a big central clock and two white painted wings, and what looked like an enormous parade ground to the rear"
after the army moved out of the city (and the building), the police took over parts of the barracks. there has been an ongoing discussion what to do with the huge bilding and only basic maintenance has been done. in 2005 the sandstone walls started to deteriorate and threatened bypassers, so the front was cheaply plastered in white (correctly described by kerr). In March Vio!ets there are several references to Hitler being elected into power. This was not so. In fact the Nazi vote was falling at the end of 1932 and defections from the SA to the Red Front were growing. Hitler was appointed Chancellor in January 1933 after a dirty deal by the then German Cabinet. The cherry-red Fokker seems to be a reference to Richtofen's red Albatros and perhaps his more famous red Fokker Dr1... or is the term just a gentle sexual joke like "Meet the Fokkers"
and I've just bumped into another. Bernie is talking about the massacre in the Katyn Forest and claims the pistols used were the Belgium-designed Russian-made Nagant. The predominant weapon was evidently German-made Walthers (supplied by Moscow. A small number of murders were committed using the Nagant) paving the way for decades of Soviet denial. It took until the 90s for the Russians to admit responsibility for the massacre and 2010 before the Russian State Duma apportioned the blame to that good old psychopath, Stalin. First a happy and - a MORE PEACEFUL New Year, amen to that! As a Swede, I found another error on page 343 (paperback edition). "...the baron von Mannerheim, Finlands´s head of state, was now in residence and, having recently signed an armistice with the Soviet Union after several years of war, he was trying to negotiate his independence of Germany, too, much to Hitler´s fury." Firstly, as I understand it, the crime conference at Wannsee takes place in the summer of 1942. Bernie´s trip to Switzerland takes place a year later, which must be in the summer of ´43. Finland didn´t sign an armistice with the Soviet Union until a year later - in August 1944, after a massive Russian offensive. Secondly, it´s true that Mannerheim became head of state of Finland (president), but this was in august 1944 also. Before that he was "only" the Commander-in-chief of the Finnish defence forces. The head of state of Finland in the summer of 1943 was Risto Ryti. This is a great website - a big thank you to all who devote your time and energy to it! It´s great to have a place where you can share your experiences and thoughts! I'm new to the Gunther series; I am just about finished with the Penguin trilogy. One ting struck me as peculiar: At page 731 (A German Requiem) Gunther refers to the Czechs who assassinated Heydrich as "terrorists." Why would Gunther, an anti-Nazi, characterize Czech patriots in such a negative manner? I've enjoyed the first four books having been recommended them by some German friends. I've bought the others but am trying to spread them out to extend the pleasurable reading! I've noticed a couple of things as a military historian, both in 'The One from the Other'. On page 194 during Bernie's flashback he describes travelling in Russia in '...light panzer wagons and Puma armoured cars...'. The Puma Sdkfz 234/2 was produced between September 1943 and September 1944 so would not have been available in 1941. On another page (which I can't recall) one character describes driving a 'panzer tank' which stuck me as silly given that panzer is German for tank. Tank tank! Thanks, everyone. These are great. not a big thing, but in "The Lady from Zagreb", Bernie´s two SS companions to Banja Luka are presented as Captain Geiger and Sergeant Oehl. But, in order to be more correct, maybe they should have been given their SS ranks - SS Hauptsturmführer Geiger and SS Scharführer Oehl. Disappointed in PK's folly in believing the nonsense about Roger Hollis, an entirely honourable man professionally - cf what Gordievsky said about him. The odd thing, though, given PK's insistence on historical accuracy, is his stating that Hollis did not attend university. Hollis was a Scholar at Clifton and went on to win an exhibition to Worcester College, Oxford, where he went in 1924 - academically very able. There he stayed for nearly two out of the three years and then left for some reason and went out East. As he would have matriculated he would remain a member of the university for life; taking the degree was irrelevant; Hollis did indeed go to university. And as it was Oxford rather than Cambridge, that nest of spies and Apostles, and Hollis was very heterosexual, it is most unlikely he would have been recruited in the conventional way. James Luckard wrote "the mere idea of a tiki bar in 1943 Nazi Germany is absolutely absurd." On one hand this is of course true. On the other hand - believe it or not - the bar for the athletes in the Olympic Village of 1936 was --- a Tiki Bar. Kind of. It was a round structure with a thatched roof, situated directly near the lake. "Sergeant Bleiker, a detective from the Zurich City Police, met me with my visa and some Swiss money, which I bought with the gold reichsmarks that Eggen had given me: the Swiss didn't like our paper money and, even with Hitler's head on them, preferred the hundred-mark coins." From a numismatic viewpoint, there are two factual errors in the above quote. First, Germany never produced 100 mark gold coins in the entire 20th Century, let alone in the 12 years of the Third Reich. Secondly, while Hitler never had any hesittion about having his image being placed on postage stamps, for some reason his otherwise ubiquitous portrait never graced any Third Reich currency, either the coins or the banknotes. A small mistake in the scale of things. Enjoying the book immensly. Rereading the series I have been struck by a few discrepancies. TODAY Wittgenstein is a household name and is known as one of the foremost philosophers of the 20th Century. This, however, would not have been the case in 1936, or even 1947-8. His Tractatus Logico-Philosophicus (only) had been published in 1921, but was not studied in Germany at all during the period in question. That Bernie and Emil Becker should have heard of this Anglo-Austrian thinker is not credible. Schopenhauer is a better bet for a token philosopher that Philip Kerr could have used, and of whom Bernie and Emil would have heard. I think his university study played a trick on him here. For HIM, indeed, with a UK philosophy degree, Wittgenstein would be the best example to use, but that does not hold for Berlin cops without academic training long before Wittgenstein's work were published. The remark also does not square with BG's avowed lack of knowledge of philosophers. That they should be referring to members of the Sayn-Wittgenstein princely family I think we may safely rule out. This fits with the historical record that tells that from 1937, as head of RHKP inside the RHSA, he held rank as SS-Sturmbannführer and was promoted to SS-Gruppenführer in 1941, with the invasion of Russia. Heydrich at the time was an SS-Gruppenfürer, already since 1934 after the Night of the Long Knives, and was only made SS- Obergruppenführer and Police Genrral on September 24, 1941, while Nebe at the time was apparently only a SS-Sturmbannführer, and, as far as I know, was never promoted to Obergruppenführer. In PF p.2 there is a reference to the Wizard of Oz, comparing Heydrich - man with a heart of iron to Tinman. How and where did BG pick up his knowledge of these matters? Baum's book is from 1900, but BG would not have been able to read it in English at this stage (1941-1942); his English would not have been good enough. In view of the date of publication, it presumably might have been prompted by the movie. But would BG read that tranalstion of what is basically a childrens' book? And, if it were possible, would he go and see such a movie at THAT time? I, for one, doubt it. The lunatic in question is Nietzsche, and the source for his saying is Aphorism 146 in Beyond Good and Evil. On page 6 Von Treitschke is quoted by BG. Such effortless display of erudition does not square at all well with his self-professed ignorance of precisely these matters in MV that I cited in my previous comment: he knew them only as streetnames and café's. Or had he spent the half decade from 1936 catching up on previously neglected reading? It does not seem very likely. What with Heydrich forcing him back into Kripo in 1938, and then the War from 1939 onwards, his leisure will have been highly circumvented. I'm British but speak some German (the nationality of my wife), and had noticed only one of the inconsistencies mentioned in this thread. I'd missed all the others. However there was another matter that intrigued me. Specifically, in the (English-language) books, PK uses some words that an English reader without knowledge of German language/idiom, would not understand. [Amongst other examples, (I) use of the word "warm" to describe a homosexual and (2) reference to a hangover as a "tomcat"]. Because I know some idiomatic German, I'm aware that "warm" is slang for homosexual and that "Kater" (Tomcat) is slang for hangover. But I suspect that very, very, few English-speakers know these terms. This made me suspect that PK might be related to the (children's) author Judith K, whose first language would have been German. Either way, I'm a dedicated follower of BG! I guess I found a very small error in "A quiet flame" in the German version on page123 (third edition February 2017). The there mentioned club "Blauer Strumpf", was not located Oranienburger Straße/"Lindenstraße". As I researched correctly it was "Linienstraße". Lindenstraße in Berlin is a some hundert meters away close to Oranienstraße. Anyway, thank you for the thrilling an quiet interesting BG stories! In one of the recent books either the Hohenstaufen(9th SS Panzer) or Frundsberg(10th SS Panzer) divisions is mentioned as participating in the Battle of Kursk, but they did not go into action until March 1944, well after Kursk(July 1943). I am a newcomer here so I hope I'm not just repeating something that has already been said. In "The One from the Other" there are double-deck trams in Munich. I am suspicious about this - double deck trams were common in Britain, Hong Kong and in places in India, but not in mainland Europe where single deck trams were (and are) always the norm. On the internet I can find no mention of double deck trams in Munich - buses in more recent years, yes, but not trams. I read the book named "Hôtel Adlon" in French, so under the original name "If the dead rise not" in English. On page nr 542 (in "editions de poche", the French edition) there is a huge mistake: it is written "32000 pesos" instead of "3200 pesos". Maybe this is only a translation error and in the English version it might be correct, again I only speak about the French translation of the book. The Backgammon player owes to Bernie 3200 pesos + 1140 (already owed before) = 4340 pesos. There is still a difference of 40 pesos which remains unexplained. But I shall not argue with the author. In fact this is a simple error, the author added a zero too fast. If 32000 was correct then the player should have given far more than 43 banknotes of 100 pesos. This being said, I loved the book and I am curious to know how (so in which novel) Bernie succeeds to quit Cuba... ("March Voilets" novel I guess since it takes place in 1936). Not necessarily wrong?? Forgive the comment on old mentions but I have seen twice the mention that Gunther comments on passing through Niedersachsen and that such a mention is incorrect because as a State it was not formed until post war. This may be correct but I think PK is allowing BG to refer to it as an "area", which the Nazis certainly did. As a former militaria collector I have seen Gau and Kreis badges from nazi rallies and booklets that mention it, such as the 1936 Hildesheim rally pamphlet entitled "Niedersachsen Marchieren!" A minor point but worth considering? Swedish Logician - I tried to see if I could find a reference to the release date for Germany. As an MGM film it is possible that it ended up on the banned list? After MGM produced The Mortal Storm (?) in 1940 which was unflattering to the regime, the nazis prohibited MGM films in Germany. As it was so successful elsewhere though its possible that BG would have read something about the film in the newspapers at the time? In Field Gray, Bernie drives “southwest” from Havana to Camaguey and Santiago, correct direction is “southeast”.